The global luxury travel market is thriving and is set to continue along this path of rapid growth. This is reflected in the growth of the luxury hotel and hospitality sector whilst remaining hotel categories are losing global market share. Over the next 10 years, the growth rate in outbound luxury trips is projected at 6.2%, almost a third greater than overall travel projected at 4.8%. Additionally, the luxury travel segment is growing twice as fast as the overall market, with a 48% increase in luxury travel in the past five years. 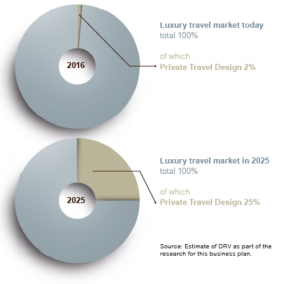 Both per capita spending on luxury travel and the number of travellers is increasing. Furthermore, the global luxury travel market is expected to garner $1,154 billion by 2022, registering a CAGR of 6.4% during the forecast period 2016-2022. 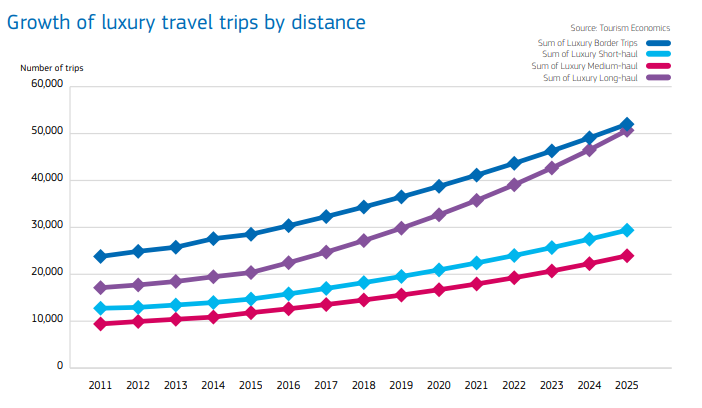 As illustrated in the diagram below, it is forecast that the number of luxury long-haul trips will grow at a considerably faster rate than that of luxury short-haul trips as customers invest in travel to new destinations and encourage peers to follow suit. INTOSOL private travel designers specialise in providing bespoke trips to long-haul destinations, meeting this key trend in the luxury travel market. Platforms such as TripAdvisor and booking.com have increased transparency in the travel market. However, the abundance of offers and booking options are simply overwhelming for some customers. There is a need for more personalised consultation which utilises face-to-face or telephone interaction with experienced professionals as well as technology. With the human interaction enhanced by technology, INTOSOL is leading the way in the luxury travel design market. A key trend driving the future of luxury travel is the shift in values from the material to the experiential. Luxury customers will avoid travel they consider to be pre-packaged and inauthentic and instead favour exclusive, one-off experiences. INTOSOL has over 16 years of experience in providing these kinds of bespoke travel solutions.